Santerre, Kobyluck, Fisher, Portenga, Moore and More! Andy Santerre hasn’t made an announcement yet as to what he’ll be doing in 2006. Word is that he’ll be back with Grizco Racing is some way, but whether that will be as a driver going for an unheard of fifth straight championship or as a team manager overseeing two and a half entries in the Busch North Series remains to be seen. If Santerre does hang up his helmet, a victory in the Toyota All-Star Showdown would have been a good way to cap things off. Santerre was right in the mix going for victory with his #44 car, but in the last 20 laps, he got sandwiched in a restart traffic jam and bounced off the outside wall in a separate incident. He finished sixth with a wounded racecar. The restart wreck started Santerre’s downhill slide. 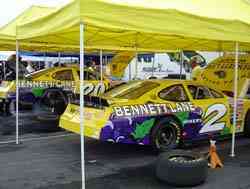 “It pushed the whole nose in and aero is pretty important at a track like this,” said Santerre. An incident with Steve Portenga’s #16 finished things off. With Mike Olsen’s disqualification from the race win, Matt Kobyluck ended up the best of the Busch North bunch. He finished second after running a clean and smart 150 laps. We’ll have more about Moore’s race a little bit later. 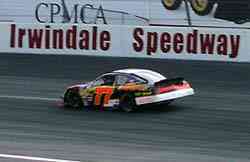 Steve Portenga ran his final race in the #16 NAPA Chevrolet at Irwindale. Next season, Richard Childress Racing will put Peyton Sellers, the 2005 NASCAR Dodge Weekly Racing Series National Champion, in the car fielded by Bill McAnally Racing as part of their driver development program. Portenga’s seventh place finish is not how he wanted to go out. “I let NAPA down and I let myself down,” said Portenga. “We wanted to do better here for the last race of the year. I ran in the top five pretty much all night long and that last restart knocked the wind out of our sails. We were saving a little bit for the end and when that happened, it got us. They all stacked up in front and it shoved everything in and got everything on my right front. It messed my whole night out and knocked the toe out and everything. Eddie MacDonald was poised for a solid finish in the Showdown after winning the Busch North season finale last month at Thompson Speedway, but like many other cars, he was involved in the late race restart wreck. MacDonald was the only driver eliminated in the skirmish though after he mangled his radiator in the incident. Near the end of the race, it looked like Kobyluck might contend for the victory, but that just wasn’t to be. The NASCAR Toyota All-Star Showdown was supposed to showcase the best of the NASCAR Touring Series performers. One of the rising stars of the bunch doesn’t think that the caution-plagued Elite Series and Grand National events really showed that at all. “It was bad,” said Moore. “I really honestly can say that I was embarrassed. Every time that the yellow came out, I was wondering what was going through these people’s heads. I’ve caused yellows before, so I guess when you get 30 cars together trying to get all of the real estate that they can, this happens. People just misjudge things and end up getting into each other. Moore wrecked his primary car in practice, but finished third in the race without incident. Ending the regular season with a victory gave MacDonald and his Jerry Morello-owned team momentum heading into Irwindale. Wrecking out of the Showdown and finishing 22nd will make for a long winter. Andrew Myers looked like he had a top 10 finish in the bag until late in the race at Irwindale. He still managed to finish 12th and was happy with the performance of his team. Getting to the finish was an adventure for the young Newport Beach, California driver. That was before an 11th hour deal with Lynch Racing as Mike David’s teammate came together. Myers (R) and Jamie Aube (L). “Everyone went and they just stopped,” said MacDonald. “Then they went again and stopped and that second stop is what got us. Usually after the first stop, everyone gets sorted out and goes, but we ended up getting into the back of someone. “We started 29th and the car was working really well,” said Myers. “We knew that we had to be there at lap 100 and on a restart, I think that it was lap 97, we pulled from 13th to 10th and that’s where we wanted to be. We changed all four tires and ran pretty decent. We started running eighth or ninth. Myers rebounded from that and almost pulled out an even better finish. 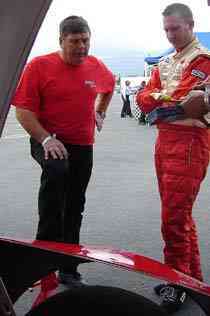 Myers had the advantage of having Jamie Aube in his pit and on his radio during the race. Aube ran in last year’s showdown as a Busch North driver and has been helping out the #14 team this season. Fisher's #20 was a team car to Mike David's #2. Jamie Aube wasn’t the only Busch North driver from last year’s race helping out in the pits this year. Dale Quarterley only ran a limited schedule and was not eligible for entry into the Showdown, but he was on hand to help out the #30 team of Jeff Anton. Sarah Fisher was eligible to race in the Showdown, but her ride with Bill McAnally Racing was only for the regular season. Efforts to find another car to drive were not successful at first and it looked like she would be sitting on the sidelines for this year’s race. Fisher had accepted that she wouldn’t be racing and was thrilled with the change of plans. 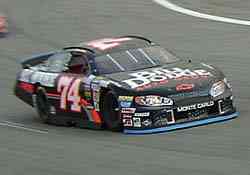 Ryan Moore ended up racing his back-up car after a practice wreck and he wheeled that #74 to a third-place finish. Moore also led the most laps during the race. The rash of caution periods hurt Moore’s chances at winning the race. “It was frustrating to fall back to fourth [Moore had been credited with fourth unofficially before the Olsen DQ], but on a short run, we had a fourth place car,” said Moore. “On a long run, we had a winning car. It wasn’t there for four laps, so I had to give it up and not cause a wreck. Moore didn’t think that going to a back-up hurt him much in the feature race. There were plenty of interested observers at this year’s showdown. A few members of NASCAR’s top brass came to watch the Elite Series race from the control tower. Mike Helton, Robin Pemberton, Brett Bodine and Jim Hunter all flew in from Phoenix to show their support to short track racing. Truck Series driver David Reutimann was also on hand, as was NASCAR team owner Richard Childress. The Northeastern open wheel ranks were also represented. NASCAR Whelen Modified Tour driver Tom Bolles was seen pacing the pit area.